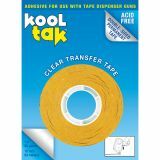 Kool Tak Permanent Clear Dispenser Tape - KOOL TAK-Dispenser Tape. It is high tack adhesive, repositionable before the item is pressed firmly for the final bond, and is a very flat bond line. For use with ATS-50 Gun. This package contains one roll of 1/2inchx36yards of clear tape. Imported.